The Perfect Apache 2.4 Hosting Solution. Whether you’re looking to develop software from scratch or want to install an application, our Apache hosting service has got you covered. We keep Apache tuned for high performance on our Business Server platform. Choose our Cloudflare Servers for much faster page loads than competing hosts. If you have any Apache Hosting questions, you can always rely on our 24/7/365 Tech Team staff to help. They can tell you how your account features leading edge versions of PHP, Perl, Python and Ruby as well as MySQL and PostgreSQL. You even get free SSH access! In addition to fast hosting speeds, you can also depend on our ultra-reliable servers because we back them with our 99.9% Uptime Guarantee. Get started now completely risk free with our Money Back Guarantee! Apache is the most used web server software worldwide serving well over half of all active websites and the top servers. Web server applications, like Apache, help your web site get accessed via the internet. It is commonly used as the server software of a LAMP stack. 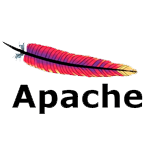 With development beginning in 1995, Apache is a very mature solution and was a major player in the growth of the world wide web. It quickly took over NCSA HTTPd as the most used web server in April 1996 and has remained the leader ever since. In fact Apache became the first web server solution to servee over 100 million web sites in 2009.